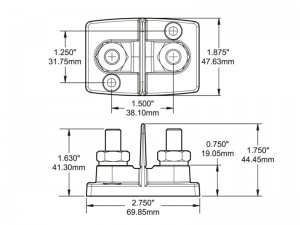 These dual power posts from from Blue Sea Systems feature 2 isolated 3/8"-16 (9.5mm) studs mounted in a compact but sturdy glass-filled nylon block. 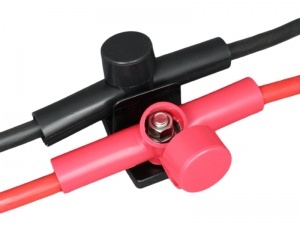 Primarily intended for extending starter motor cables from outboard engines they are also ideal for joining cables in any high current application on boats or in vehicles and can be used as an alternative to 2 individual power distribution posts. 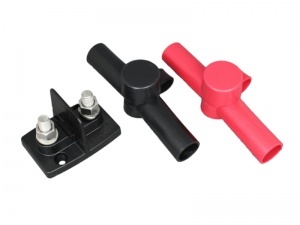 Rated up to 48V and supplied complete with dual-entry, red and black PVC terminal covers. The fixings are stainless steel to resist corrosion in a marine environment and include anti-vibration locking washers. 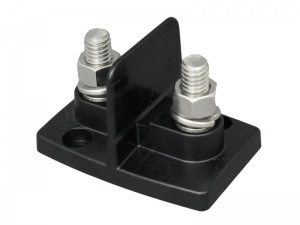 The block can be fixed to a flat surface using the two mounting holes. just what I needed for my boat, cant find them anywhere else. good quality, good service.